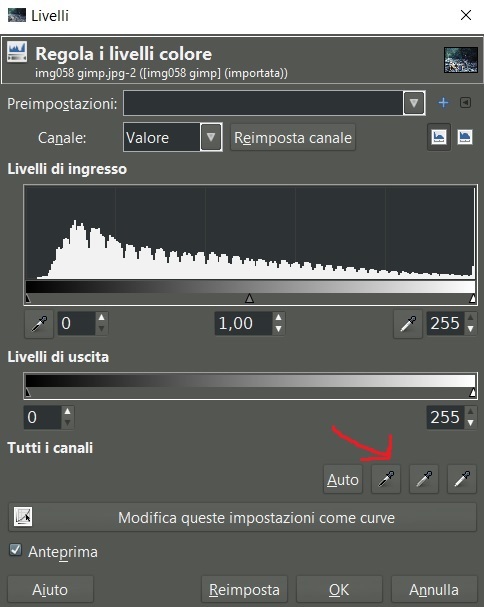 It would be very useful and appreciated (at least for me) adding this feature under levels and curves adjustement. It would be useful. But I find it easy enough to set white and black points by dragging triangles in histogram, using eyedropper to click black and white does not bring much advance. YMMV. Hi Fixx, and thanks for your answer. First of all I must admit I'm a total newbie in photo editing and I bought Affinity Photo just 2 days ago coming from Gimp. At the moment my only purpose is this: I decided to acquire (scanning) all my old slides and unfortunately the oldest ones have a color cast (on some very strong, even if they were correctly stored) that I want to correct; using Gimp, under Level adjustement, setting white and/or grey point with the picker you often achieve a satisfactory/good result (on slides with just one "color cast's color", for example blue) or a good starting point for the more problematic ones. So I decided to buy AP 1st for its more advanced color correction's tool (CMYK that Gimp doesn't have) and 2nd for the inpainting tool to get rid of dust and imperfections on positive films; in these 2 days I got slightly better results with AP rather than with Gimp (on very problematic slides), but for the other "simple"color cast's correction the procedure in Gimp is faster and easier, 3-4 clicks and you're done (using levels adj. with WGB pickers of course); using AP instead, I need more time to reach the same result ( but maybe I'm doing something wrong or I can't find the right tool inside the program), that's the reason why I asked for the "3 eyedroppers feature". There's a separate White Balance adjustment layer. Its controls include a picker for sampling your image. Tks, I already tried the White balance adjustement layer but its result is weak compared to the "3 pickers" ( I noticed that color casts are easier to correct with the grey or grey and white picker, while using only the white eyedropper I can't reach the right (for me) color correction), I think it could be ok for a correctly exposed photo (from digital cameras), but not for one who's affected with a color cast; I also tried the same tool under Development Persona (no difference) but it's not the same result you can get with Gimp or, at least, it needs much more time and effort to achieve it. PS: my scanned slides are all in .jpeg format. I can second this request, having 3 pipettes for black, mid-grey and white is definitely desirable. I second this request too.